Singing bowls have obvious healing effects. The physical vibration of the sound waves, when a bowl is placed directly on the body, massages the cells and organs in a delicate way, and releases energy blockages. Their sounds influence the brain waves in a positive and balancing way, and they have a calming effect on the nervous system. Singing bowls promote deep relaxation with subtle but sometimes profound healing effects. Once you have undergone it yourself, you naturally want to share it with other people. What better way is there than doing a healing session for your partner, family member or friend? Make sure the person lies down in a truly comfortable position. Check them out, get pillows for support, under the head, under the knees, wherever it is needed. Shoes off, blankets if it’s chilly. 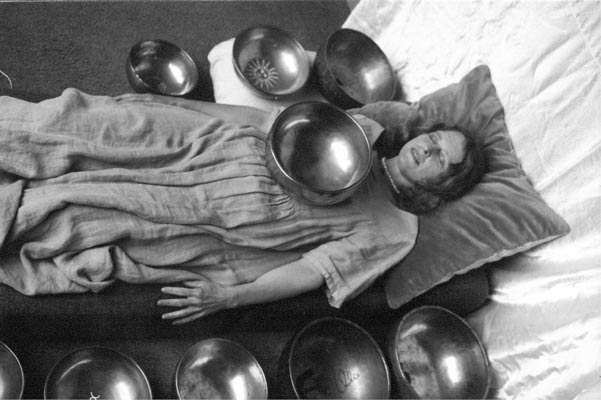 When you have more than one singing bowl, put one of them on the chest and the other somewhere around the body, preferably by the head. When I start out with a private session, I first intuitively feel out which bowl the person needs most, and this is the one I place on his chest (with the anti-slip mat underneath). This will be the most important bowl to play and the most healing for that person at that time. Do not strike it too hard, as it is close to the ears of the person. Nor is it necessary to strike it constantly, as the person will still be able to hear the sounds well enough even when you do not hear them anymore. Aside from these considerations it is up to you and your own intuition to feel how you have to play the bowl. It is really nice when you play a bowl to hold it and move it around the body, passing it over the body, and especially around the head of the person. Not only does this create a nice sound effect for the person, but this technique allows you to tune in to the energies, chakras or aura of that person and work to clear any negative energies you might find by creating harmony there instead. Remember that healing is not something that has to be done this way or that way. Healing is more about tuning in and feeling out what needs to be done. Then transform the energy in a totally naturally way, without any interference of your ego. You do not heal, you help to create a space that allows healing take place. The healing will be whatever is necessary for that person, at that time, and in those circumstances. I often put a flat pillow behind the head of the person, on which I can place a bowl to use in direct relation with the bowl I have placed on the chest. Working with the two bowls together creates a link between those two places on the energetic level, and it seems to have a really good effect on the person. The chest is an important area to work on, as a lot of childhood traumas are stored there. Singing bowls can be placed on the belly too, but the very big bowls can be too heavy. Bowls on the legs can work too, but the legs need to kept together, otherwise they will touch the bowl at the side and dampen a lot of sounds. The back is also a good place to place singing bowls, as long as the person is comfortable and does not have to stretch the neck sideways too much. With a little ingenuity in positioning even hips and shoulders can be worked on. Singing bowls are but instruments, and how you use them depends on your way of healing. They can be used along with with Reiki, hands-on-healing, and massage, or whatever you discover with your own creative imagination .